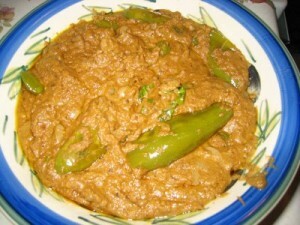 Mirch Ka Salan recipe by Nazia Nazar at PakiRecipes.com. Deep fry green chillies in hot oil. Grind together dessicated coconut , garlic , ginger , sesame seeds and roasted onions and peanuts to make a fine paste. Reheat oil already used for frying chillies. Ensure that the paste does not stick to the pan. Fry the salan paste for 20 minutes, keep stirring it. Pour 15 ml of water at regular intervals. Add yoghurt and salt and stir for 3-4 minutes. Now add the tamarind pulp and 15 ml of water. Stir for 5 minutes until the gravy is of sauce consistency and ensure that it does not stick to the pan. Add the fried chillies to the hot gravy. Remove and garnish with finely chopped coriander leaves .